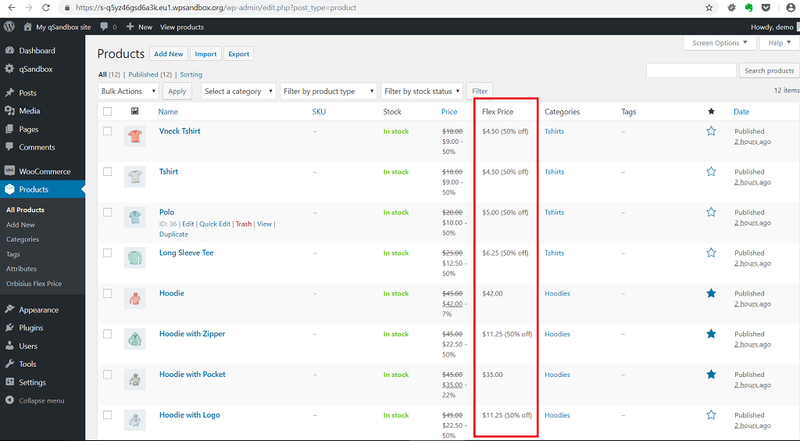 This WooCommerce extension allows you to bulk change the prices change product prices (up/down) for all products or for a selected category and its subcategories. The plugin allows you (temporarily*) change product prices (up/down) of all products or for products that belong to a specific category and its subcategories. The price change can be by a specific amount or a percentage. The plugin will NOT apply price change in the WordPress admin area so you can see the actual price unmodified. Less risk of than updating the price directly. * Fixed weird redirect loop due to a recursion. The plugin -> req Woo Price -> Woo calls filter get_price and from start again. * Fixed the error message shown when WooCommerce is not active or installed. * Fixed: Errors were showing up if no product category was selected. * Added functionality to change sale price even more (see plugin's settings). * Improved the right sidebar in the plugin's settings page. * Added percentage off from the sale price thanks to LogoLogics for ideas and code.